Music serves many purposes in our lives. One of the most important is how it can perfectly express emotions that we struggle to convey with our own words. For example, no words that I could arrange together could ever come close to the simple but beautiful song Si Supieras, covered here in this 1974 recording by Colombian legend Alfredo Gutierrez. I’ve been trying to hunt down the original by Alfredo’s Panamanian equal Osvaldo Ayala, but no luck yet. (Perhaps one of my fellow Pelanguer@s has the original?) I’m in awe of how music that had absolutely nothing to do with you during it’s creation can over time become deeplly personal and practically essetional to living. Anyway, short of learning the accordion to serenade my sweetie with, I’ll continue to rely on records like this to play for her and to be grateful to the many artists who allow us to emotionally extend ourselves throughout our lives. Enjoy! This entry was posted in PELANGA RECORDS! 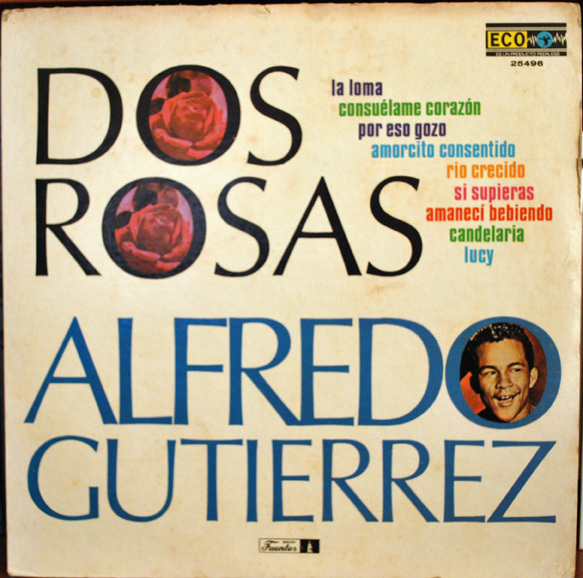 and tagged Alfredo Gutierrez, Dos Rosas, Osvaldo Ayala, Si Supieras by Jacobo (DJ Pozole). Bookmark the permalink.